Plays that remain as powerful, awesome, and resonant as they were when first written are few and far between. 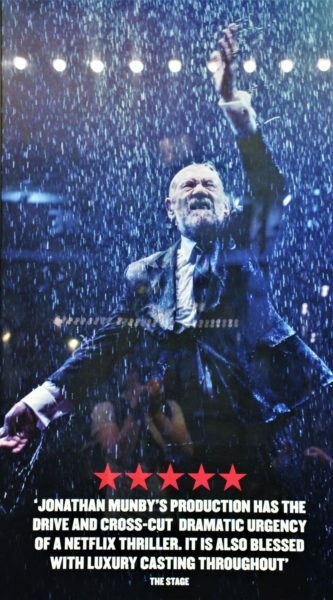 King Lear, with its tale of tragedy, humility, conflict, and fallibility, is arguably among the best of the best. With such a high calibre play it takes an extraordinarily good cast to propel the production to success. And the cast here has astronomical credentials. When done well, the audience is immersed in the play. In this case, the audience falls away, and the individual cannot bring themselves to turn away from the action. Renamed the Duke of York’s Theatre in 1893 in honour of the future king, the opulent decoration follows through the atrium, along the tiered seating, opening into the vast arch-framed stage. While traditional in appearance, the set should not be underestimated, as concealed within the constantly moving backdrop lie throne rooms, dank cells, tempests, forts, and even the White Cliffs of Dover. Between the rain, lightning, fire, and blood, the stage can never be considered dull. The setting also keeps the contemporary vibe, with costumes that look like they’re from ‘The Crown’ complementing 21th century military uniform. And there’s nothing like a larger-than life painting to not-so-subtly display the King’s absolute belief in absolute infallibility. The cast itself is stellar. 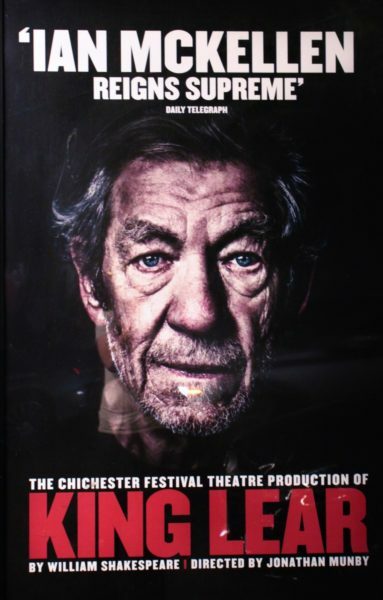 Sir Ian McKellen, better known to some as Gandalf or Magneto, returns to the role of King Lear in possibly his best portrayal of the troubled king yet. Sinead Cusack shines as Kent, both in favour and in exile. Danny Webb brings home the humanity and deception of the play, as Gloucester goes from powerful court figure to pitifully crippled in a gut-twisting, squeal-worthy scene. Regan, Goneril, and Cordelia are also studies in acting excellency; in particular Kirsty Bushell, earlier this year performing in Chekhov’s The Cherry Orchard, become recognisably unrecognisable as a completely different persona. The creative team behind the production should also be acknowledged. Director Jonathan Munby has managed to produce an adaptation faithful to the text in a contemporary setting, meaning the audience cannot be bored. The lighting design, composition, and sound, as well as costume design, were not unlike the level of sophistication reached by film and TV productions, impressive on a stage budget. The fight scenes were consistently engaging and adrenaline-inducing, with knives and firearms present and adding to the atmosphere of intimidation. All choreographed scenes moved fluidly with no hint of hesitation. Overall, the production is a force to be reckoned with. Cast and direction merge together to bring the text to life, as intriguing, shocking, and moving as when first performed on stage. The play is thoroughly worthy of one of Shakespeare’s darkest tragedies. This production is highly recommended for anyone, regardless of familiarity with King Lear or Shakespeare. Anyone familiar with the cast through film will likely have their expectations of the actors exceeded. And while the plot is truly dark, the cast so obviously enjoy themselves on stage (most notably during the curtain call) that it makes for a breath-taking and exhilarating experience.